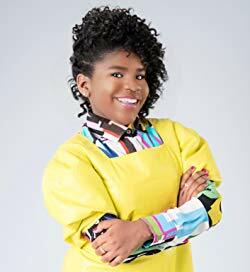 Trinitee Stokes is an American child actress, singer, dancer and fashion designer. She is best known for her portrayal of Judy Cooper in the Disney Channel television series K.C. Undercover. She also provided the voice of Princess Tiana doll in the animated musical movie, The Princess and the Frog. She has also made guest appearances in a number of television shows such as Teachers and Austin & Ally. As a singer, Trinitee released her first single, “Win Now” in 2013, and released the independent pop single Miss Me in 2017. Born on April 12, 2006 in Jackson, Mississippi, USA, to parents Taronta and Kia Stokes, she made her acting debut at the age of three appearing in her mother’s first stage play production. *She was born on April 12, 2006 in Jackson, Mississippi, USA. *She began her acting career at age 3 in local theaters.